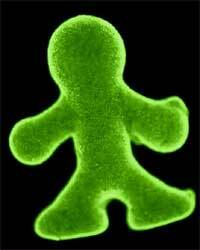 Researchers at the University of Tokyo, wanting to show off fabrication of living biological structures, have created a 5 millimeter tall doll made completely from living cells. To make this creepy living doll, they cultivated balls of skin cell covered collagen in doll shaped molds. After they combined into a single chunk of tissue, they survive for more than a day in a culture solution. The head researcher hopes to combine multiple types of cells to make a system that functions as a living organism. If you ask me, that is getting too close to Frankenstein and Jurassic Park, but it’s cool nevertheless.